Synonymous to its name, Reliance Smart is a new age supermarket serving the needs of today’s smart and value seeking customers. 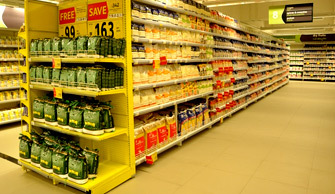 Reliance Smart offers a one-stop shopping experience by offering fresh produce, bakery, dairy products, home and personal care products, general merchandise and in many cases are co-located with our fashion & electronics store Reliance Trends and Reliance Digital, making it a complete shopping destination. Reliance Smart’s incredible value proposition rewards shoppers more & more for bigger purchase, every single time they shop with 100% assortment being offered below MRP all year round, while delivering a world-class shopping experience. We started our journey from Mumbai & Pune and soon will be extending our network in other cities. RelianceSMART.in has made grocery shopping even simpler and convenient by bringing it to customers door step. No more hassles of sweating in crowded markets or grocery shops, RelianceSMART.in offers over 6,000+ products at comfort of your home, office or on the move. We offer you convenience of shopping everything that you need for your home - be it fresh fruits & vegetables, cereals, packaged food, bakery & dairy, frozen & pet food, household cleaning items to your specialised beauty & personal care products from a single virtual store.